(Nanowerk News) A research team from the University of Greifswald and the Helmholtz-Zentrum Berlin (HZB) has solved the molecular structure of an important enzyme (MHETase) at the synchrotron radiation source BESSY II. MHETase was discovered in bacteria and, together with a second enzyme – PETase –, is able to break down the widely used plastic PET into its basic building blocks. This 3D structure already enabled the researchers to produce a MHETase variant with optimised activity that can be used, together with PETase, for a sustainable recycling of PET. The results have been published in the research journal Nature Communications ("Structure of the plastic-degrading Ideonella sakaiensis MHETase bound to a substrate"). Plastics are excellent materials: extremely versatile and almost eternally durable. But this is also exactly the problem, because after only about 100 years of producing plastics, plastic particles are now found everywhere – in groundwater, in the oceans, in the air, and in the food chain. Only a tiny fraction of plastics is currently recycled in expensive and energy-consuming processes, which yield either downgraded products or depend in turn on the addition of 'fresh' crude oil. Around 50 million tonnes of the industrially important polymer PET are produced every year. In 2016, a group of Japanese researchers discovered a bacterium that grows on PET and partially feeds on it. They found out that this bacterium possesses two special enzymes, PETase and MHETase, which are able to digest PET plastic polymers. PETase breaks down the plastic into smaller PET building blocks, primarily MHET, and MHETase splits this into the two basic precursor building blocks of PET, terephthalic acid and ethylene glycol. Both components are very valuable for synthesising new PET without the addition of crude oil - for sustainable closed-cycle production and recovery. In April 2018, several research groups were finally able to solve the structure of PETase; this was also made possible due to experiments held at the Diamond Light Source. However, PETase is only part of the solution. It is equally important to characterise the structure of the second enzyme, MHETase. “MHETase is considerably larger than PETase and even more complex. A single MHETase molecule consists of 600 amino acids, or approximately 4000 atoms. The surface of MHETase is about twice as large as the surface of PETase and therefore there is a significantly larger number of potential options for modifying the surface of this enzyme and optimising the decomposition of PET ,” explains biochemist and structural biologist Dr. Gert Weber from the joint Protein Crystallography research group at the Helmholtz-Zentrum Berlin and Freie Universität Berlin. During an interim professorship at the University of Greifswald, Weber contacted the biotechnologist Prof. Uwe Bornscheuer at the university’s Institute of Biochemistry, who was already investigating plastic-degrading enzymes. 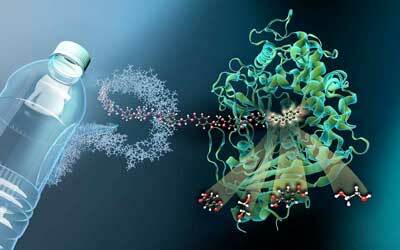 Together, they developed the idea of solving the structure of MHETase and then using this insight to optimise the enzyme for use in PET recycling. To do this, they first had to extract the enzyme from bacterial cells and purify it. This collaboration has now succeeded in obtaining the complex three-dimensional architecture of MHETase at BESSY II, the synchrotron source at HZB in Berlin. This was made possible by using the particularly bright X-ray light that is produced by the facility. “In order to see how MHETase binds to PET and decomposes it, you need a fragment of plastic that binds to MHETase but is not cleaved by it,” explains Weber. A member of Weber's former research team in Greifswald, Dr. Gottfried Palm, cut up a PET bottle, chemically decomposed the PET polymer and synthesised a small chemical fragment from it that binds to MHETase but can no longer be cleaved by it. Tiny crystals were grown from this 'blocked' MHETase for structural investigations at HZB. “The structural investigations enabled us to virtually watch MHETase ‘at work’ and develop strategies for how to optimise this enzyme,” explains Weber. “Thanks to the joint research group format, we are able to provide beamtime access quickly for measurements on the highly demanded BESSY II MX beamlines at any time”, says Dr. Manfred Weiss, who is responsible for the BESSY II MX beamlines. The MX beamlines (MX is short for macromolecular crystallography) specialise in the screening of tiny crystal samples of organic, very large molecules; the data collected can be used to decipher the 3D folds of these macromolecules. The three-dimensional architecture of MHETase indeed displays some special features: enzymes such as MHETase bind to their target molecule before a chemical reaction occurs. To break down a molecule you need a tailor-made enzyme: “We can now precisely localise where the MHET molecule docks on to MHETase and how MHET is then split into its two building blocks: terephthalic acid and ethylene glycol,” says Weber. However, neither PETase nor MHETase are particularly efficient yet. “Plastics have only been around on this scale for a few decades – even bacteria with their rapid succession of generations and prompt adaptability have not been able to develop a perfect solution using the evolutionary process of trial and error in such a short time period,” explains Weber. “Thanks to the clarification of the structure of this very important enzyme, we have now also been able to plan, produce and biochemically characterise variants that show significantly higher rates of activity than natural MHETase and are even active against another intermediate product of PET degradation, BHET,” adds Uwe Bornscheuer. In the future, Uwe Bornscheuer will therefore work on systematically optimising the enzymes PETase and MHETase for their task - the decomposition of PET. Gert Weber plans to supplement these studies with further work on biological structures in order to systematically develop plastic-digesting enzymes for various environmental applications. Access to the measuring stations and the IT infrastructure at HZB is indispensable for this work. Producing these kinds of enzymes in closed biotechnological cycles, for example, could be a way to actually break down PET plastics and other polymers into their basic building blocks. This would also be the key to ideal recycling and a long-term solution to part of the plastic waste problem: production of plastic would be a closed cycle and no longer dependent on crude oil.